Tidal lagoon technology could be a cheap and reliable source of renewable energy, according to former Energy Minister Charles Hendry. Tidal lagoon energy - A rising or falling tide? 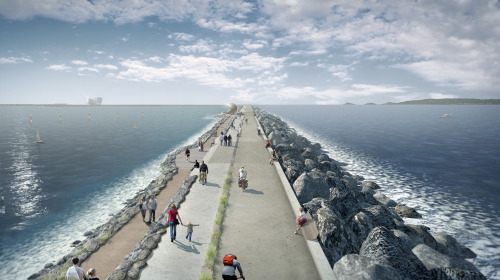 RenewableUK is welcoming a review of the benefits of tidal lagoon energy. The study was commissioned by the Government, and carried out by the former Energy Minister Charles Hendry. Hendry said tidal lagoon technology can deliver a secure supply of energy for a price that’s competitive in the long term, stating the equivalent of the cost of a pint of milk per household per year. He added that tidal power is a completely predictable source of energy. The review is significant for Tidal Lagoon Power. The company secured planning consent in 2015 to build the world’s first tidal lagoon power plant in Swansea Bay. This 320 megawatt (MW) project will generate enough power to meet the annual needs of 155,000 homes. The company aims to begin construction within a year of getting a final green light after the successful conclusion of negotiations with Government. It is the first project of its kind in the world, marking the start of a whole new industrial sector. We can expect to see significant cost reductions as each further project is built. RenewableUK’s Chief Executive Hugh McNeal said: “It’s great to have this ringing endorsement of innovative technology and modern industry. The world’s first tidal lagoon in Swansea Bay can provide power for our national energy needs and create local jobs for decades to come. Government should finalise negotiations so that work can start on this important infrastructure project as soon as possible. This is a new growth sector with huge potential to bring industrial-scale economic opportunities to the UK. Each new tidal lagoon will drive down costs due to economies of scale, benefitting consumers, as well as strengthening the security of our energy supply. “The UK’s future energy mix will be powered by a broad range of low carbon technologies which can be delivered by British companies. This means investing today in new sources for tomorrow – including marine energy technologies such as wave, tidal stream, and tidal lagoons”. The full review can be read here.